This collar is another thrift store find. It is labeled "Burberry London" on the inside, and each stud says "Burberry" along with the buckle. This is a leather collar with an overlay in the iconic Burberry House Check pattern. 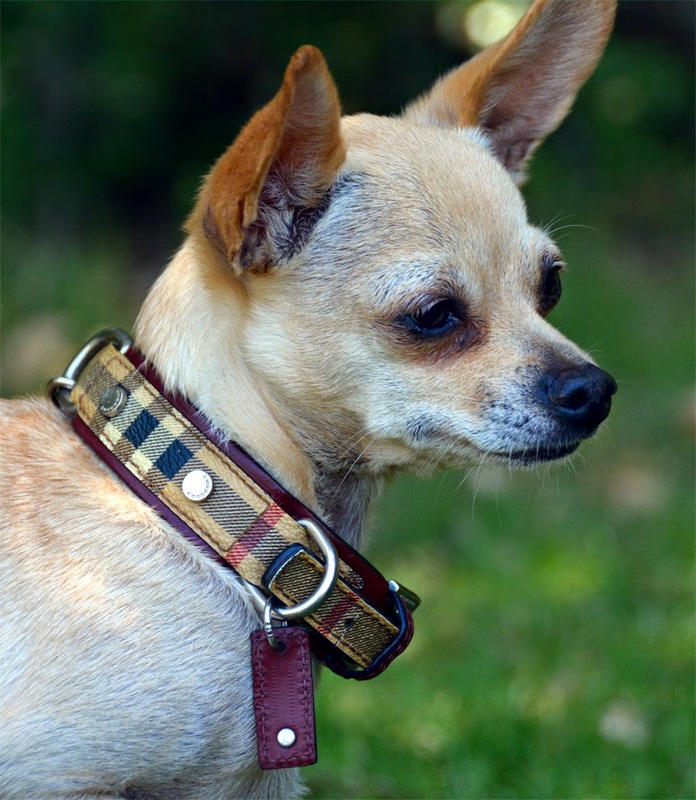 This is a very wide collar for a small dog, it fits necks 8-11" around and is a full inch wide. I believe this collar was available in 2005, Burberry does not currently offer any dog collars or accessories as part of their 2014 line. There are knockoff collars with Burberry check patterns, but unlike Coach I don't believe Burberry routinely produces dog collars. This one seems to be a very high-end reminder of the dog boutique fad of a decade ago. Remember when tiny dogs as fashion accessories were suddenly popularized by celebrities, and everyone had to have a pursedog? Remember when everyone from Target to Toys'R'Us to Victoria's Secret had to have a dog boutique full of adorable collars and sweaters and bowls and beds? All sized for dogs well under 30 pounds? I still have two sets of Old Navy rain booties that date from 2001. I'm actually rather disappointed that the fad ended around 2006, well before I got a pursedog of my own.